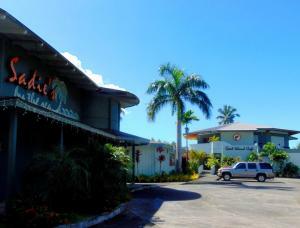 Set in a prime location of Utulei, Sadie's by the Sea puts everything the city has to offer just outside your doorstep. The hotel has everything you need for a comfortable stay. Free Wi-Fi in all rooms, facilities for disabled guests, luggage storage, car park, room service are there for guest's enjoyment. Comfortable guestrooms ensure a good night's sleep with some rooms featuring facilities such as air conditioning, telephone, television LCD/plasma screen, satellite/cable TV, refrigerator. Access to the hotel's private beach, outdoor pool, garden, water sports (non-motorized) will further enhance your satisfying stay. No matter what your reasons are for visiting Utulei, Sadie's by the Sea will make you feel instantly at home.